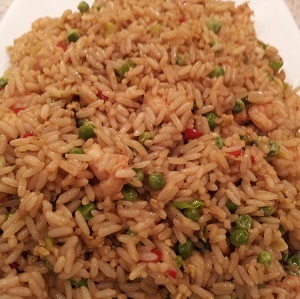 Excellent Shrimp Fried Rice to accompany your favourite Asian dishes. In a large bowl add the rice and 1 tbsp canola oil. Add the stir-fry sauce and turn heat higher and quickly mix well together (stir-fry). Continue to stir-fry until everything is well mixed (1-2 minutes). Add the spring onion and red chili and continue to stir-frying another minute. Leftover rice is the best and used for stir-frying the next day.